I have to take the time to say though it's not in the best area of town, the Great American Music Hall is a lovely venue. It is the oldest nightclub in the city and was named this year's best place to see live music. It has an antique, elegant look to it inside but still maintains a modern and intimate feel. While this was my seventh time seeing Steel Train live, the last time had been in 2004, and I nearly forgot just how great a live band they are. 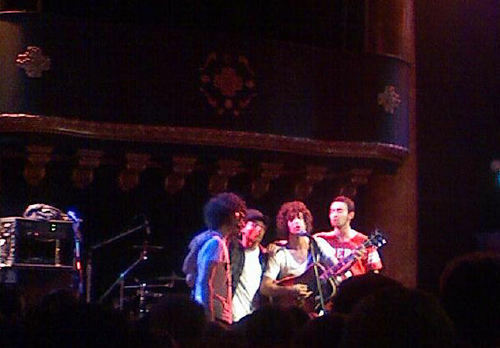 They played mostly songs from their upcoming album, the first one being "Alone on the Sea," which kicked off the set. You can hear the demo version of it on their Myspace page. A few songs in was my favorite of the new songs, "Blackeye." It has a great vibe to it, and lead singer Jack Antonoff's vocals are superb: rich and strong but not overpowering. He is a vocalist I genuinely just love to listen to. Next, the whole band gathered around the center stage microphone and sang "Road Song" with only guitar accompaniment. Featured on their first full-length album, Twilight Tales from the Prairies of the Sun, this song is an up-beat number about, well, being on the road. It features great harmonies and has a nice call-out to the name of the band itself several times in the lyrics, e.g. the line, "I passed my life by the course of steel train / and I'll ride to the end of the rails." 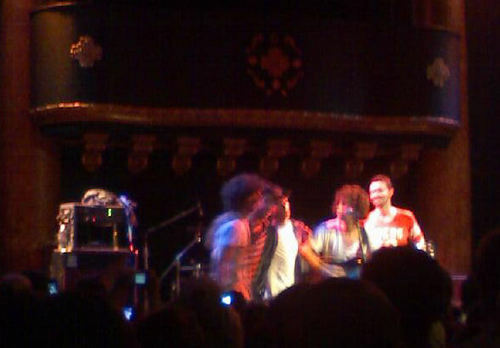 Nate Ruess, lead singer of The Format, came out to sing on the new track titled "Kill Monsters in the Rain." The blending of Nate and Jack's vocals brought a great quality to the song; their voices compliment each other perfectly. The set ended with "Firecracker," which is backed equally by bongos as it is drums and has a throwback feel. Jack made sure to get the audience's involvement in the chorus especially, and the band's time spent on stage ended on a high note. It was clear they had won over a lot of new fans. Next in the line-up was Limbeck. Their music is generally fun, catchy and easy to sing and dance along with. They opened with "Brand New Orange," which is one of their songs I do like. Truth be told, I have never been much of a Limbeck fan. Their style just isn't really my thing so I was kind of anxious for them to finish up, but by no means are they bad live - quite the opposite, actually. The highlight of their set was easily "In Ohio On Some Steps"; of all the songs performed that night by all bands, this got one of the best audience responses. A large group of people sang along from all over the the theatre, creating a powerful echo as it came together as one voice. I was really excited to see The Honorary Title because I hadn't been able to catch them live before. They opened with "Untouched and Intact," the title track to their new EP. Great way to start off their set as it introduces you to the twist to musicality and vocals these guys bring. "Bridge and Tunnel" was next. This is one of my favorites, and the album it is on, Anything Else but the Truth, is one that was music-therapy for me, so I was happy to hear any of the songs from it. I've always believed this song is really led by the drums; it is what makes the transitions from verse, bridge and chorus so seamless. "The City's Summer" is unmistakable, with the lead in being "Na na na na na" repeated over and over. It is a fun song, the kind that leads you to have it on repeat for hours and can't get out of your head for days. Lead singer Jarrord Gorbel apologized to the crowd inbetween songs by saying they "have no idea what [they're] doing" set-wise. After a short pause, the band started into "Everything I Once Had." Insert extreme burst of happiness from me. This is possibly my favorite Honorary Title song. The allure to it for me begins with the unpolished feel; it makes it feel much more intimate. This is a song about a failed relationship, but it does not follow any typical cliches. You can't help but have your mood shift to the feel of the song; it really shows the personal quality this band has to their sound, with their ability to pull their listeners through an array of different emotions. Next was another of my favorites, "Frame by Frame." The lyrics show off the poetic way Jarrod has with words. I would love to try and paint a better picture as to what these guys sound like, but it is hard to describe the sound of the band as a whole - they definitely fall under the indie category, but each song takes on such a new feel that it would be a shame to try and classify it all to one genre. The band closed with "Cats in Heat," a simple yet still elegant song. The melody is beautiful; the verses are backed by a slow drum, but all instrumentation stops when transitioning into the chorus, showing off Jarrod's unique and mesmerizing vocals. It was a disappointment to see the set come to a close. And, finally, our headliner, The Format. They opened with "Dog Problems," which is the perfect way to kick off a set as it starts a capella, with occasional piano pieces, before slowly easing into full band. Next on the set was the ever-popular track from their album Interventions & Lullabies, "The First Single." (As a side note, I must fully recommend this album. There is not one bad song.) Now if there were ever a more properly titled song, I don't know what it is. It is the epitome of a perfect first single: it is inherently catchy, well-written with relatable lyrics, and fun to crank the volume up on and sing along to. Segueing into "Wait, Wait, Wait," it shouldn't take you longer than this point in the show to realize the magic The Format has live. They capture the sound of their records, but enhance it greatly. I have never personally been or known anyone else who has been disappointed upon seeing these guys live. A highlight was one of my favorite tracks from the band's most recent album, Dog Problems, "Time Bomb." Despite the sarcastic and bitter edge to the lyrics, it is such a feel good song. Not to mention it has some of my favorite lyrics from the album in general: "Starting now I'm starting over / tell the new wave kids their make-up kits can find me where self pity gets a breath of fresh air." An emotional time stopper in "On Your Porch" is always something to look forward to. Nate's vocals take on a different tone from most other songs and emote the subject matter of the words in a heartbreaking way. I would be surprised to hear anyone not getting chills from hearing this. Even if you never plan to see The Format live, downloading this is a must. It's just one of those songs. Now, to do a 180, "The Compromise" ended the regular set. Starting off with full band, it quickly dies down to guitar and vocals for the first few lines of the first verse, before delving back into complete instrumentation. It is another exuberant example of the band's success at creating catchy songs. The line "So it's your job to dance and smile the whole time" is really the most apt description of the reaction this song brings. The encore featured a great mix of songs, the best in my opinion first being "Inches and Falling." The horns bring a new zest to the music, solidifying the anthem-quality to love this song speaks. 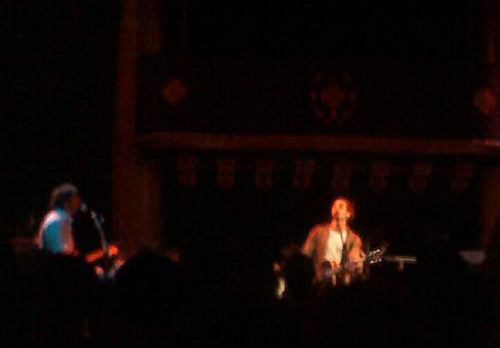 The show ended with the performance of "She Doesn't Get It," another of the best songs from the band's sophomore album. It has a bit of an electro feel in parts, all the while maintaining the original element the rest of the tracks showcase. Overall, this night and line-up of bands did not fail in bringing a sold out crowd of hundreds of kids an amazing evening of music. Each band has their own unique sound, whilst still complimenting each other perfectly. Check out this tour if you get the chance! wow, the format played a pretty long encore. i can't wait to see this tour! Oh I love The Honorary Title! You are right, they are such a talented band. Wish I could have been there!! Sounds like a great show. I'm jealous! You did a fantastic job on the review, especially with all the detail w/ the music. It makes reading more enjoyable! Wow, what a great line up! You did an awesome job on the review. I love your details on the music and songs themselves, it makes reading fun for all of us. Thanks! I just saw the concert last night in chicago. It was amazing, easily the best show I've seen all year. Every band played with loads of energy and got the audience involved. Only thing different about my show is that "Piebald" took the place of "The Honorary Title." I've seen The Format a couple of times and you are dead on, they are amazing live. On the Porch made me cry! (Yes I'm a baby:)) I love your writing. You know how I feel about Steel Train! I saw this tour (the first time around a few years ago) and it was amazing so it's great to see it featured here. Great job describing everyone! nice job on this one. i love the details you put in about the honorary title, it brings their music to life. you write the best reviews. i love your reviews t. =) your memory for nuances in songs and describing them is wonderful! Love the detail and setlists for all the bands. Really brings the concert to life. I recently saw this tour as well and I will echo that it was amazing. You did a much better job than I ever could at capturing the essence of each band. Your love for music comes through your writing and that is great to see. no give it up? :( thats my favorite format song. something tells me you're too scared to goooo. anyway, another great review taylore. i'm rooting for you! I love The Format too. Their new cd is really great and all of the songs sound good live. I agree with you about 'On Your Porch', that song is something special. I think it's great you gave almost equal attention to all of the bands there and not the headliner. Openers are often forgotten and they deserve some words as well! I agree about Steel Train they are a marvelous band and amazing musicians. It is great to find another fan. I'm jealous you got to see this tour, I wasn't able to go. It is indeed a great lineup. Love the review. goooood job girl! i remember wheen steel train opened for soco, i really liked them. i'll have to find their more recent songs and listen! I love the details you put in here like setlists. Seeing Limbeck and The Format together would be a dream! Looks like a fun show! Awesome! Thanks for posting this, it is a great review. All of those bands deserve the recognition.